Understanding Stir-Fry is easiest if you understand the background that the wok is normally used in. Namely Asian peasant and street kitchen. Poor people that are trying to get the most out of the least. The round bottom, allows you to cook without using too much fat. 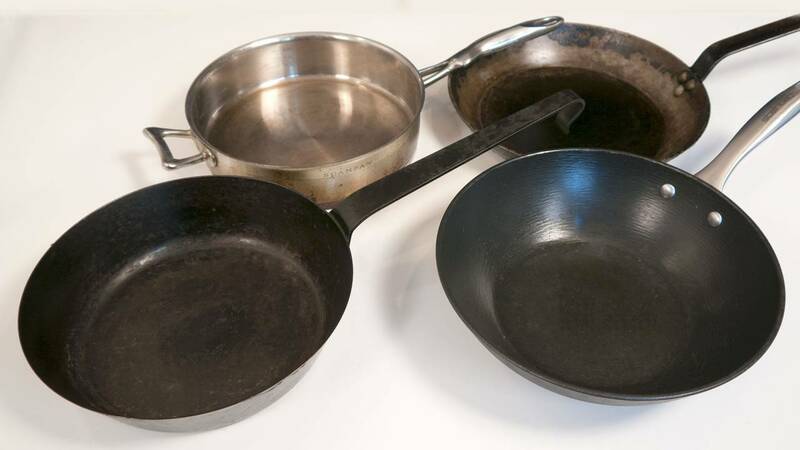 The fat does look like a large portion in a wok, but there is typically less than you use on a flat frying pan. It is simply pooling together. Cooking time for a wok is typically short. So although it must be very hot, it uses relatively little energy. 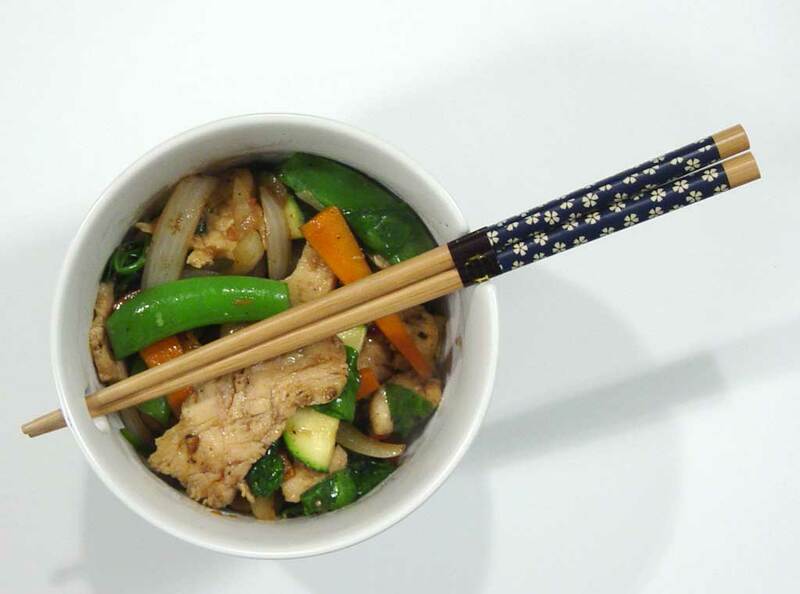 Stir-Fry is also eaten with chopsticks. This has an impact on how you cut and prepare the ingredients. They must be small enough that you can put them in your mouth directly. There is no knife on the table to cut them with. But they must also be large enough that you can hold them with two sticks. The cooking time for any ingredients is mostly dependent on their thickness. The thinner you slice them, the faster they will be done. This also helps lowering the energy consumption. By a "happy coincidence" this all fits in perfectly well in a stir-fry. The cutting style supports both the eating style, taste, health and your purse. The only negative is the cost of time spent on preparation. It takes a long time to cut it all in the right size. The regular "stir fry cut" is thinly sliced and bite-sized chunks. If you remember the above principles there should really be no doubt about how your ingredients should be cut. To achieve any browning of these quite thin ingredients for maximum flavor, without the vegetables going soft, or the meat getting chewy, in the process, you have to use very high temperature. Wok burners typically use 6-7 KW when burning. A normal stove is typically 2-3 kW per burner. My main burner is 3.5 KW as far as I recall. This makes it harder to make Stir-Fry on a conventional stove. You only have half the energy to put into the food. In my garden I have a gas burner at about 9-10 KW, which is a real joy to use for stir fry. But boy does it empty my gas bottle. The best thing about stir frying is that the vegetables becomes so good. Golden and fried on the outside while they are still al dente to the bite. That means you get both maximum flavor and nutrients out of them. Most vegetables must be cooked before you get the best nutrition from them, while others should be served raw. Sometimes you also get different nutrition out of the same vegetable depending on whether it is cooked or raw. Stir fried vegetables are actually both raw and fried at the same time, so I do not think it gets any healthier than that. They are also fried in fat, and many of the useful vitamins in vegetables are fat soluble. If the vegetables are just cooked in water or steam, there will be many beneficial micro nutrients we can not absorb. Again, stir fry is ideal. The primary question is what wok pan to choose. That depends a bit on the type of stove that you have. My stove is gas, so for me the choice was easy. A classical wok that is completely round, and in thin punched carbon steel. The authentic wok. 10€ ($13) it cost me in the local Asian corner shop. An excellent tool at an excellent price. If you have an electric stove, it is very difficult with a round-bottomed wok. Verging on the impossible even :-S That is a shame because it makes it hard to limit the amount of oil. However, you can make quite excellent Stir-Fry in a flat-bottomed wok. When I do use electrical stoves I try to use an induction cook top. It is far the best for stir fry. On electric cook top I use my sheet metal Sauté pan or my flat bottom wok pan. There is no technical reason to use a more expensive cast iron wok. However, it will work just as well as the sheet metal on induction, so if you think it's nicer feel free to do so. You can buy a wok made of a thin plate having a flat bottom. Those you have to be careful about. Thin plate dents easily when heated quickly. A wok with a dented bottom has no contact with the plate. Then it will not become hot, and it will be quite impossible to make a proper stir fry. This is no problem with induction, but with a regular electric burner it quickly becomes inefficient. Nonstick wok pans I will under no circumstance recommend. The whole idea of a stir fry is very high temperature. Nonstick coatings are a very poor fit for this. So it's a silly idea! Professional wok cooks use a long metal shovel to stir with. It is both fine and inexpensive. I just use my regular slotted metal spoon, and it works fine. 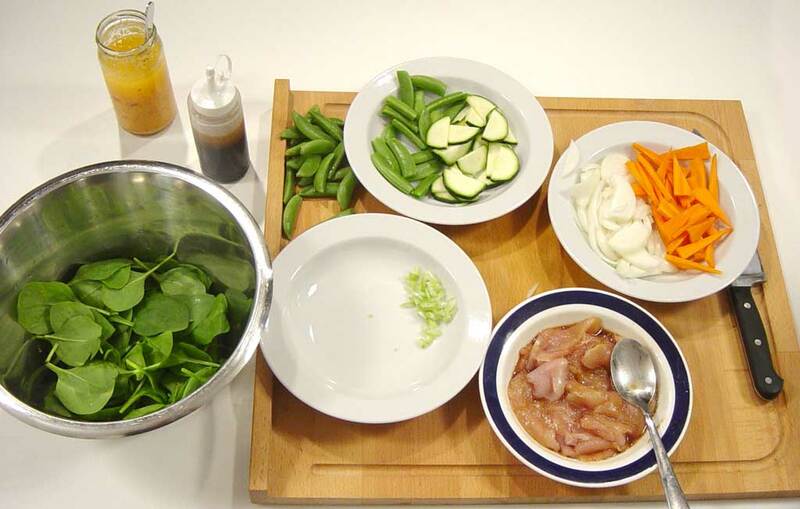 The major work with Stir-Fry is undoubtedly the cleaning and preparation of the ingredients. Once you begin to fry, you do not have the time to cut anything. So all the ingredients have to be ready before turning on the wok. Another important part of stir fry technique is the order in which you cook and fry the ingredients. The trick is that all the ingredients must be ready and al dente at the same time. If in doubt, you can cook them separately, and then set them aside. Or use the "two-pot" technique I mention below in "step 10". Marinate the meat. If you want any kind of sauce thickener in your stir fry then add it now. It seals and helps to brown the meat. I typically marinate with my 123 mix mixed with a few tsp cornflour. It also gives some extra flavor to brown the thickener. Prepare all the herbs and vegetables. I usually put them onto plates sorted by the order they should be cooked in. This reduces the risk of errors. It is important for the vegetables to have the same size. In particular thickness. This helps them finish up at the same time. If you do not cut them the same way every time you will not learn how the vegetables responds and you will not know if some of your vegetables are too soft because of your cutting technique or because it has been cooked for too long. Personally, I use snap peas as the perfect model for vegetable cutting for a stir fry. If the vegetables have roughly the same size and thickness as a whole snap pea, they are cut out perfectly. Heat the wok until it begins to smoke without the fat. If the fat heats up, at the same time as the pan it often becomes too viscous and unhealthy. So add the fat just before starting to cook. Especially if you use vegetable fat instead of animal fat. Add the fat and heat it up. You could use my GCG (Garlic Chili Ginger) mix instead of plain fat. When the oil is just about starting to smoke, it is ready. You can see it in the emerging "convection" or ripples in the fat. The fat begins to come alive. If you do not know what I mean, and you'll recognize it quickly when you first see it. I prefer animal fats like lard, chicken or duck fat. But most people use vegetable fats/oils. Like corn-, rapeseed- or sunflower oil. Olive oil is not suitable. Both because of flavor and a low smoke point. Roast the meat in smaller portions., It should be browned not boiled! Take it off and set it aside. If you only make enough for one or two people you can certainly get away with cooking it all at once though. When frying the meat, you must make sure that there is a plenty of room in the wok. The individual pieces of meat should not touch each other and they should certainly not be in layers. If the liquid from the meat does not evaporate immediately, then you have added too much meat or too little heat. It boils instead of frying. A good trick is to spread the meat out all over the wok and let it fry until completely finished on one side. DO NOT touch it before it is finished on the first side. A pro wok cook-top has a very high temperature, and it will brown the meat no matter how much you turn it over. In a home situation you typically need to let the ingredients fry slightly longer to get the right color and flavor. Add a little liquid to loosen the caramelized remains. You can use 123 mix, soy sauce, rice wine, dry sherry, stock or water. If the meat has left some residue in the wok, then dissolve it with a little liquid and "dress" the meat with the resulting "sauce". It is important to add as little liquid as possible. Too much liquid will steam the rest of the dish. Put the meat aside on a plate or similar. The thin slicing has the effect that as soon as the meat is browned, it is finished. If you fry it along with the vegetables it will just become chewy. onions, which are finely chopped. This provides a different flavor than when added in the beginning and cooked through. A good tip, when making large amounts of stir fried vegetables is the "two-pot" method. Use a regular frying pan and another larger pan. Brown the vegetables at high heat in the frying pan, and as soon as it is gets some color, you put it into the other pan, which keeps it warm at medium temperature. The pan should be without a lid. Otherwise, the vegetables will become steamed and soft. It is also a good method if your cook top cannot become hot enough. Fry the "quick" and soft vegetables. The dividing line between soft and hard vegetables is actually not that clear. It is also a matter of taste whether you prefer a certain type of vegetables more tender than others. So experiment a little. Add the meat again. Just to warm it up again. Add more stock as needed. You can also add oyster sauce. wine, water or something else. but no more than the cornstarch from the meat can thicken. A tbsp of cornflour can typically thicken 1 dl (½ cup) of liquid. Add pak choi, cabbage and/or lettuce. Heat it a few minutes. Salt to taste. This depends on how much 123 mix or soy sauce and fish sauce you have added. There is a lot of salt in those. So usually it is not necessary add more salt.